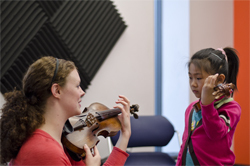 Choosing the right music school IS a big deal. After all, it could have a major impact on you or your child’s future, so you want to make a good decision! As you can probably guess, not all music schools are created equal. You’re looking for a place that offers a high quality education experience, but that should be a given. 1. Who are the instructors? How does the school choose the teachers and are they properly vetted? Are they members of a faculty who see their job as a career, or are they extreme part-timers, or worse... temporary freelancers? 2. What do other people have to say about this school? This is huge! You definitely want to hear from people who have. Read testimonials. Look on social media to see what people are saying. Definitely check out the school's own social media pages. Chance are, you already have friends who attend the music school. Be sure to ask them about it! 3. Are the school’s policies easy to understand and do they work for you? A good music school will go the extra mile to make things easier for you, not for themselves! So before you get involved, research the policies to make sure they are user-friendly. Do they have a payment plan? Do they give discounts or special offers for families with more than one student? What is their policy regarding makeup lessons should you have to miss one? If you sense that the school doesn’t make the your experience THE most important thing, it’s a red flag. 4. Are there opportunities to perform? One of the best ways a student can is by performing for and with others. So you want to be a part of a school that offers MANY amazing performance opportunities. Recitals are usually (but not always) a given, so ask about other things, like open mic nights or jam sessions. What about off-site concerts for advanced students or ensembles? Check to see if the performance opportunities require an extra fee or if they are included in the regular cost of tuition. 5. What are the facilities and the location like? Where was I? Oh yeah, the building. Make sure there are places where parents and siblings can hang out and that’s Is it a cool place you love going to. So those are five important questions to ask when you are choosing a music school. And guess what? We have five more for you! So be sure to stay tuned for Part 2 coming up soon!